Regardless of the thread you have a lack of intellectual curiosity, that is illogical. You need to shut down now Robbie. Yea, I remember him from Forbidden Planet, staring Anne Francis. the Russians sent up the Sputnik. As every school child knows, Robbie the Robot made other appearances as well. The YouTube video that izzythepush was so kind to post features a film clip from an episode of the TV series Lost in Space, which I did not like. Among her other accomplishments, Anne Francis also starred in "The After Hours" -- one of the best episodes of The Twilight Zone, which I did like. And (oops!) 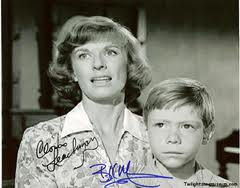 Billy Mumy (the boy in the YouTube video) also starred in several Twilight Zone episodes, including the unforgettable "It's a Good Life." I did like the TV series, but I was a kid myself. Didn't like the film though. You mean Twilight Zone: The Movie (1983)? I didn't like it, either. In fact, I was quite disappointed in it. Of course, Rod Serling (who had passed away in 1975) had nothing to do with it. No I mean the film Lost in Space with Gary Oldman. The film Lost in Space was truly one of the most awful wastes of film ever.